netBlazr Archives · Stop the Cap! A Boston firm believes broadband is something best shared, and plans to put that notion to the test by bringing free access to wireless broadband to anyone in range of its equipment. Use the included equipment to receive service from NetBlazr and agree to share it with anyone in range of the wireless antennas included in the kit. 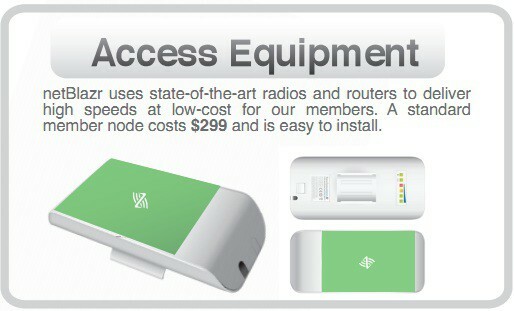 Reception of the wireless broadband signal, comparable to Business Class DSL, comes with no ongoing fees. If you want dedicated, guaranteed speeds, NetBlazr will sell them to you at an added cost. The more customers exchanging signals, the more robust and faster the network becomes, says NetBlazr CEO Jim Hanley. Although the service is currently designed to operate for business customers in downtown Boston, Hanley sees the possibility of crowdsourcing a broadband platform eventually large enough to cover residential homes and businesses across the country, at almost no expense. The venture is new, however, and the company’s FAQ warns businesses not to depend entirely on NetBlazr for dependable broadband just yet. Because it’s still new, the quality and level of service is highly dependent on what kind of signal one can receive from the next nearest business that belongs to the cooperative. If you are the only one for blocks around, the signal could be marginal to non-existent. Such communal networks only work when they reach a critical mass of cooperative members to blanket areas with coverage. At the moment, that means Boston’s Back Bay and downtown, where high-rise buildings help get the signals around densely populated neighborhoods. 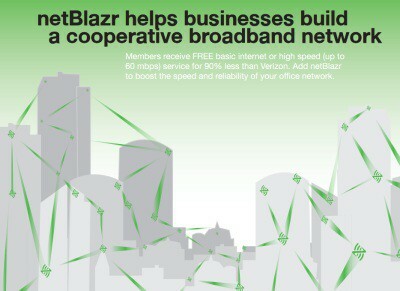 NetBlazr’s marketing brochure touts the service can deliver symmetrical speeds up to 60Mbps for free, and is particularly suited to offices that need additional broadband resources, but don’t want to sign a pricey upgrade agreement with incumbent providers like Verizon. NetBlazr’s competitors like the aforementioned phone company are reacting with a shrug of the shoulders so far. “We aren’t familiar with this company’s business proposition, but I can tell you that Comcast already offers secure and reliable high speed Internet,” spokesman Marc Goodman told the Boston Herald. Earlier efforts to share Internet services in neighborhoods through Wi-Fi ran into trouble when Internet Service Providers found out. Virtually all providers specifically prohibit customers from sharing their residential service with non-paying customers beyond the property line. But since NetBlazr arranges for its own access, this stumbling block is overcome. Company officials say they have enough connectivity to support the demand, although business users don’t traditionally pound networks with peer-to-peer file requests or lots of online video, so how NetBlazr will ultimately perform in a residential setting remains to be seen. The company has impressed technology mavens at the Massachusetts Innovation & Technology Exchange. NetBlazr won this year’s “Best Bootstrapped Start-up” award. It was also a finalist for the $1 million MassChallenge competition held earlier this year. Hanley’s ultimate goal is to provide cheap, commodity Internet access, and thinks within five years his idea will be a major game-changer for how broadband service is delivered in the United States.